Because of the transitive nature of music, and performance, musicians must become comfortable with uncertainty. A performance will never be perfect; a piece never played the same way twice. In music, there are no absolutes, and musicians are experts at accepting that. Comfort with uncertainty is important in becoming more independent, because it allows you accept and adapt to whatever comes your way. Music can seem like an exceptionally overwhelming area of study to those who have never been trained. It requires a great deal of self-motivation to continue to study music, since there are no quick fixes in learning music. Time, patience, and perseverance are the hallmarks of musical education, and this can be intimidating to many, because it seems like there is always too much still to learn. Self-motivation is an important skill in gaining independence; it ensures that your drive to learn and succeed comes from yourself, instead of from external sources. Although music is an art form, it is also a discipline. The study of music, the act of performance, requires a self-discipline that few other areas do. Learning the music, practicing, and honing a piece for performance means an incredible amount of dedication and commitment. Discipline like this is so important in becoming independent because it ensure that you won’t give up, even when things become difficult or overwhelming. 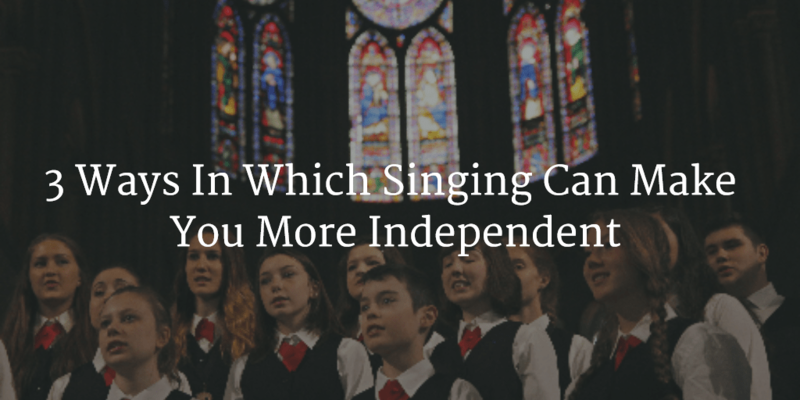 How else might singing make you more independent? Tell us in the comments below!